Fused and blown glass embedded with copper and wire attached to a variety of found objects and mixed media. 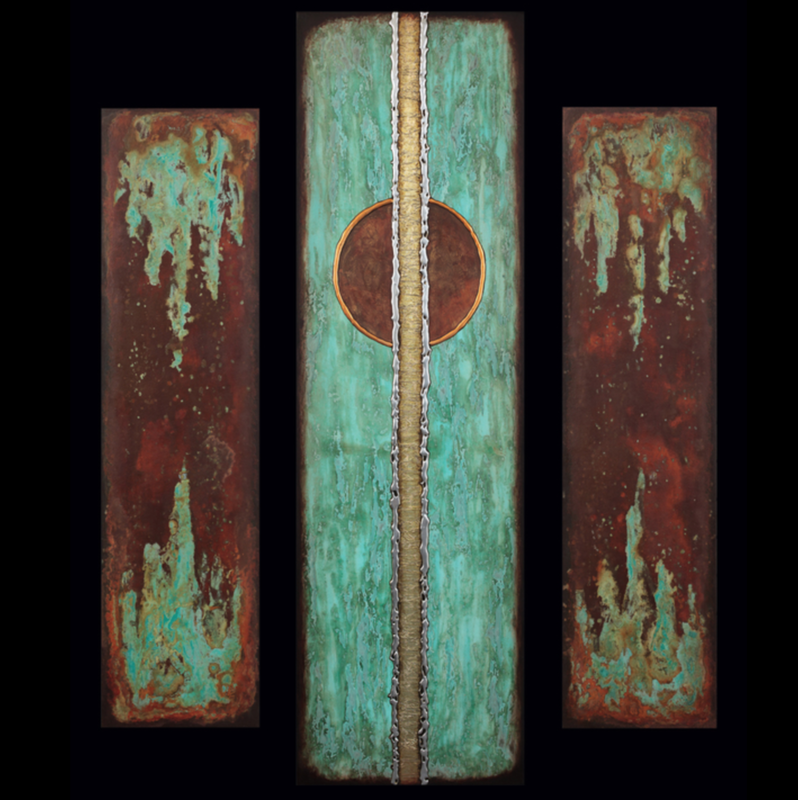 Canvas and wood panels, plaster, acid oxidized paints, acrylic paints, copper, gold and aluminum metal leaf, epoxy & varnish. Fragments of slate split thin with a chisel, then shaped into long skinny pieces with needle nose pliers. These fragments are embedded in epoxy resin, sanded and buffed. My art is encaustic medium on wood panels or paper. I incorporate reductive scraping and sgraffito techniques. I often use encaustic mono-prints or my photography in college or assemblage. Cartography-inspired artwork in mixed media. We sculpt and paint clay in our "Islands", cut intricate designs from wood in our "Neighborhoods" and “Bridges”, and draw illustrations for our "Landmarks"
Unique mix of art and technology! 3 dimensional, computer drawn, CNC carved wood wall art - hand painted with unique hand finishes. MDF on hand made pine frame with acrylic paints. I use wild acrylic backgrounds and oil pastel for my content. Our nature photos are digitally abstracted, printed, then painted to further define its form & identity. The finished piece combines the chaotic beauty of nature with the careful touch of the artist. Western fashion to home décor, using many types of leather, both tooling and inlays, all designed and created by me. I handtool custom pieces as well as design leather belts, jewelry and home décor. Contemporary art on metal using mixed media of oils, acrylics, air brush and epoxy. I create my work on canvas, canvas on board or steel. I use a mixed media of acrylic enamel, acrylic, and oil, I use a variety of acrylic mediums, including modeling past, paper and an acid free sand. A unique medium of hand cut impregnated plaster gauze shapes. Individually sculpted into wildly intricate textures.Technique has evolved to produce intensely textured paintings and enormous sculpture. I paint with printing ink, oil, acrylic, and enamel paint on aluminum, birch panel, and canvas. Each painting is an original, one of a kind. My work starts with a broad sketch on canvas, layering underpainting colors with ink, carbon, marker, oil pastel, finishing the painting with oil paint washes in an abstract and bright happy work. Individually handcrafted and hand tuned Musical Instruments, Windchimes/mobiles and suncatchers from natural, renewable and recycled materials.